In considering the conclusions that may be drawn based on our evaluation of barrier mitigation strategies, it is important to recognize that establishing clear links between barriers and specific model parameters and their ex-post magnitudes requires extensive research, and our analysis was constrained by the limited availability of this type of information in the literature. 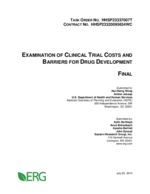 Nevertheless, our results can help to inform the discussion surrounding possible barrier mitigation strategies and their relative impacts on drug development costs and returns. Our results are summarized in Table 10 below. According to our model, priority review vouchers and improvements in FDA review efficiency can help to shorten timelines and increase expected NPV to the drug sponsor. However, these strategies do not reduce the cash outlay needed for the clinical studies. Therefore, holding everything constant, these options may be less appealing as strategies to stimulate drug development than alternatives which substantially lower costs, especially early on in the clinical research process (i.e., in earlier phases). Use of lower-cost facilities/in-home testing and wider use of mobile technologies appear to be most effective in reducing costs across therapeutic areas and trial phases. Use of lower-cost facilities and/or in-home testing can reduce per-trial costs by up to $0.8 million (16 percent) in Phase 1, $4.3 million (22 percent) in Phase 2, and $9.1 million (17 percent) in Phase 3, depending on therapeutic area. Wider use of mobile technologies can result in very similar maximum savings; $0.4 million (8 percent) in Phase 1, $2.4 million (12 percent) in Phase 2, $6.1 million (12 percent) in Phase 3, and $6.7 million (13 percent) in Phase 4. On the other hand, relaxing trial enrollment restrictions and reducing SDV efforts have smaller impacts on costs, resulting in maximum savings of less than $0.1 million to $0.2 million per trial, representing around one percent of study costs. Notes: “Minimum” and “maximum” define the range of savings across all therapeutic areas. Cost savings are shown as negative values. [a] Mitigation of the barrier reduces FDA review phase duration thereby reducing time to market for the drug. This improved the revenue stream for the sponsor but does not have direct cost impacts in the model.